Ratings agencies, though private organisations, wield enormous influence on investor perceptions of a country or economy. Whether Standard and Poor’s, Moody’s or Fitch, silky praise or clinical castigation, has a direct effect on the price of sovereign debt and bears heavily on investment decisions in Hong Kong, Singapore or London. Businesspeople on the ground in Ulaanbaatar know this only too well. So it is with pleasure, we discover Moody’s has issued a B3 stable outlook for Mongolia. After the country being considered anything but stable for the last few years, we delve a little deeper into the reasons Moody’s has reached this assessment. 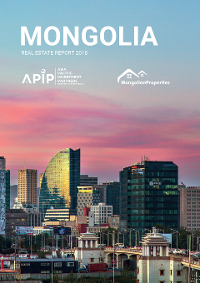 In Mongolia’s commodities-driven economy, there has been aggressive cyclicality. This means a headline growth rate alone, is insufficient to instil confidence, because as the old adage goes, ‘what goes up, must come down’. Commentators, now, however, are predicting a stable outlook in the coming years, as governance changes begin to take effect. We’ve already reported the IMF’s projection of 8% growth by 2019. Though Moody’s is soberer- predicting 7% growth by 2021- it forecasts maintenance of this rate year-on- year. Citing robust demand-side fundamentals for copper and coal, due to urbanization and development of renewables in China, this analysis is welcome news for Mongolian producers. Mongolia is not fully ship shape. It still has to repair its hull and sort its rigging. But it’s a hell of a sight better than even twelve months ago. Prior to the International Monetary Fund (IMF)-led bailout agreed in February 2016, there was real concern of default. Without, cooperation with the IMF, Mongolia could have been in a deeply invidious position. 2017 was used by Mongolian politicians to refinance existing obligations pushing out maturities to 2021. In October, it raised US$800m by way of a 5.5-year bond, enabling it to repay debt due in January 2018 (FT). More important perhaps, it was oversubscribed and at a rate of interest significantly lower than before. Foreign reserves are also up- albeit from a relatively low base. According to Moody’s, they now stand at around US$2.6bn compared with US$1.2bn in 2016. 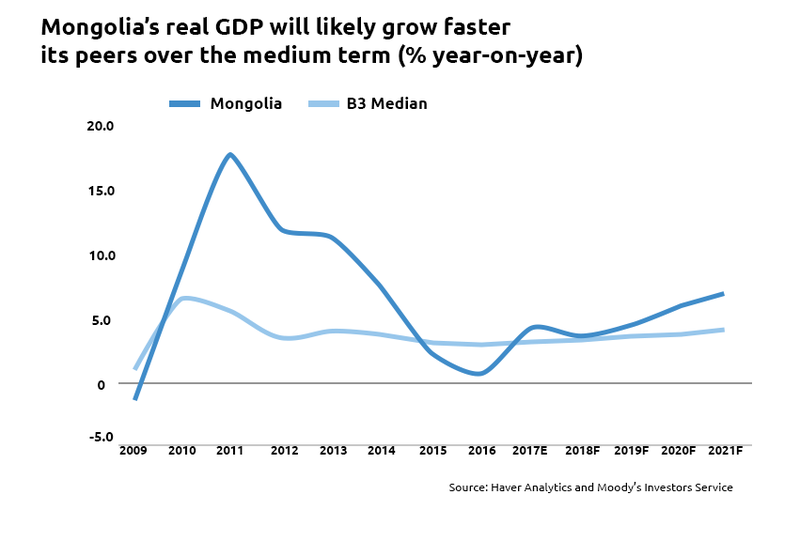 In short, Mongolia is still indebted, but if it keeps to its current path, the situation could markedly improve in the mid-term (Moody's). Moody’s acknowledges fiscal consolidation in Mongolia has occurred more swiftly than initially anticipated. The country has been able to address structural flaws by virtue of rising GDP growth, and increased revenues- especially from the extractive industry. In 2016, the fiscal deficit stood at around 15% of GDP. But by November of 2017, the government in Ulaanbaatar was projecting a year end position closer to 9.5%. Moody’s, in fact, predict the deficit will be ‘slightly narrower’ than government estimates, at around 9.3%, given revenues for the first eleven months of the year were up by nearly 28% (Moody's). This doesn’t ignore the fact, however, that its position remains fragile. One of the reasons people take seriously the analyses of Moody’s and others is they avoid the hubris of market makers, and the pessimism of cynics. Largely, research is dispassionate, and gives a considered view of what could come next. There’s no doubt, Mongolia is still too dependent on China. It is too dependent on minerals. Its debt to GDP ratio remains high, and stubbornly so. But as the headline makes plain, it is stable. And not only that, stably on its way to a rate of growth many countries would envy. Gone, hopefully, are days of explosive boom and stark recession, replaced by consistent expansion, and with it, prosperity. This is not a given. Mongolia, as Moody’s makes plain, needs to continue is progress from last year, and stick closely to its program of substantive reform. At APIP, we’re readying ourselves for a very busy 2018. We’ve now completed the Olympic, have started presales on the Circus, and have a series of consultancy instructions. If you want to hear more about our services, why not book a meeting with one of our team? In the meantime, enjoy our latest quarterly economic update and stay warm in the cold weather!